Dimitri - you're pulling out all the stops now - That is nice large hawkbill - one heck of a blade Spring loaded? Or is that just a blade lock off the bolster? Hope you don't mind me asking or guessing as to location of origin - Spanish or Eastern European? Or neither ... Interestingly I haven't seen many German hawkbills but that would not be my guess here ... How about dating of this big boy - early to mid 1900s? LongBlade wrote: Dimitri - you're pulling out all the stops now - That is nice large hawkbill - one heck of a blade Spring loaded? Or is that just a blade lock off the bolster? Thanks Lee! No not spring loaded just a conventional back spring and that is a lock to keep it open. LongBlade wrote: Hope you don't mind me asking or guessing as to location of origin - Spanish or Eastern European? Or neither ... Interestingly I haven't seen many German hawkbills but that would not be my guess here ... How about dating of this big boy - early to mid 1900s? Don't mind at all I welcome questions There are no marks on this knife at all but I have seen many with French and Spanish marks, so either one would be a good guess as to where it was made. As to a date pre 1930 is as close as I can get. I have a French knife that Dimitri identified, he got lucky , that’s got a very hooked hawkbill. Lyle - Given all the vineyards in France I can see a big need for hawkbills ... When I think about French knives I think most I have seen were horticultural and hawbills..
Miller Bro's wrote: Here's a giant. MAN, what a knife! I bet that joker can cut off a big ole limb. "...... are you gonna pull those pistols or whistle Dixie?" Then the jealous crow cried "Cora!...Why do you mock me so? You'll always be a beauty and I, a jealous crow." George Butler picked this up a couple of weeks ago and never posted it. Nice one Bill, looks like as had little use. Thanks John, I have thought about cleaning it a little. BWT wrote: George Butler picked this up a couple of weeks ago and never posted it. 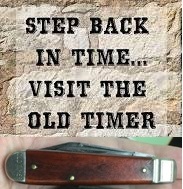 If you can get me a clear picture of that knife and stamp I may be able to help you identify it. Would also like to see pictures of the other ones you mentioned! wlf wrote: I have a French knife that Dimitri identified, he got lucky , that’s got a very hooked hawkbill.